Last week, I had the pleasure of being Freshly Pressed on WordPress.com – that is, I was a featured blog on their home page. As a result, I got more traffic and more interesting comments from people in one day than I have since I began blogging. Thanks, WordPress editors! I’ve been really excited and inspired by the exchanges I’ve had with others, including the ideas and themes we all started circling around. Most of the dialogue was about a post I made on technology, memory, and creativity. Here, I was interested in the idea that the more we remember the more creative we may be simply because we have a greater amount of “material” to work with. If this is the case, what does it mean that, for many of us, we are using extremely efficient and fast technologies to “outsource” our memory for all sorts of things? – from trivia, schedules, and dates, to important facts and things we want to learn. What does this mean in terms of our potential for creativity and learning, if anything? What are the pros and cons? I was fascinated by the themes –maybe memes? – that emerged in my dialogue with other bloggers (or blog readers). I want to think through two of them here. I am TOTALLY sure that I wouldn’t have developed and thought through these issues to the same degree – that is, my creativity would have been reduced – without these digital exchanges. Thanks, All. Are We Becoming Cyborgs? The consensus is that – according to most definitions – we already are. A cyborg (short for cybernetic organism) is a being that enhances its own abilities via technology. 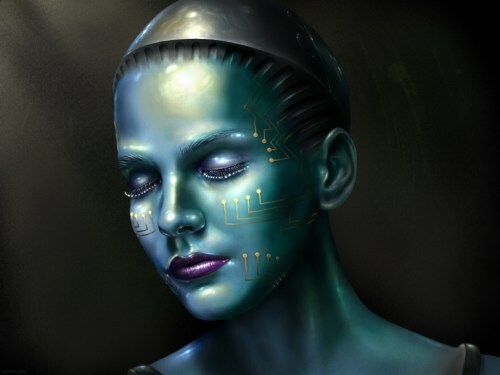 In fiction, cyborgs are portrayed as a synthesis of organic and synthetic parts. But this organic-synthetic integration is not necessary to meet the criteria for a cyborg. Anyone who uses technology to do something we humans already do, but in an enhanced way is a cyborg. If you can’t function as well once your devices are gone (like if you leave your smart phone at home), then you’re probably a cyborg. Yet, on the whole, comments on my post last week were not made in this spirit of excitement and promise – rather, there was concern and worry that by augmenting our abilities via technology, we will become dependent because we will “use it or lose it.” That is, if we stop using our brain to do certain things, these abilities will atrophy (along with our brain?). I think that’s the unspoken (and spoken) hypothesis and feeling. Indeed, when talking about the possibility of being a cyborg, the word scary was used by several people. I myself, almost automatically, have visions of borgs and daleks (look it up non sci-fi geeks ;-)) and devices for data streaming implanted in our brains. Those of us partial to future dystopias might be picturing eXistenZ – a Cronenberg film about a world in which we’re all “jacked in” to virtual worlds via our brain stem. The Wikipedia entry describes it best: “organic virtual reality game consoles known as “game pods” have replaced electronic ones. The pods are attached to “bio-ports”, outlets inserted at players’ spines, through umbilical cords.” Ok, yuck. This suggests that, not only are we augmenting ourselves all the time via technology, but we are defining ourselves in powerful ways through the massively social nature of online life. This must have costs and benefits that we are beginning to grasp only dimly. I don’t have a problem with being a cyborg. I love it in many ways (as long as I don’t get a bio-port inserted into my spine). But I also think that whether a technological augmentation is analog or digital, we need to PAY ATTENTION and not just ease into our new social landscape like a warm bath, like technophiles in love with the next cool thing. We need to think about what being a cyborg means, for good and for bad. We need to make sure we are using technology as a tool, and not being a tool of the next gadget and ad campaign. The Second Brain. This got a lot of play in our dialogue on the blog. This is the obvious one we think about when we think about memory and technology – we’re using technological devices as a second brain in which to store memories to which we don’t want to devote our mental resources. But this is far from a straightforward idea. For example, how do we sift through what is helpful for us to remember and what is helpful for us to outsource to storage devices? Is it just the trivia that should be outsourced? Should important things be outsourced if I don’t need to know them often? Say for example, I’m teaching a class and I find it hard to remember names. To actually remember these names, I have to make a real effort and use mnemonic devices. I’m probably worse at this now than I was 10 years ago because of the increased frequency with which I DON’T remember things in my brain now. So, given the effort it will take, and the fact that names can just be kept in a database, should I even BOTHER to remember my students’ names? Is it impersonal not to do so? Although these are relatively simple questions, they raise, for me, ethical issues about what being a professor means, what relating to students means, and how connected I am to them via my memory for something as simple as a name. Even this prosaic example illustrates how memory is far from morally neutral. I’ll take an idea from andylogan.wordpress.com as a starting point – he alluded to future training in which we learn how to allocate our memory, prioritize maybe. So, perhaps in the future, we’ll just become extremely efficient and focused “rememberers.” Perhaps we will also start to use our memory mainly for those types of things that can’t be easily encoded in digital format – things like emotionally-evocative memories. Facts are easy to outsource to digital devices, but the full, rich human experience is very difficult to encode in anything other than our marvelous human brains. So if we focus on these types of memories, maybe they will become incredibly sophisticated and important to us – even more so than now. Perhaps we’ll make a practice of remembering those special human moments with extreme detail and mindfulness, and we’ll become very, very good at it. Or, on the other hand, perhaps we would hire “Johnny Mnemonics” to do the remembering for us. But a fundamental question here is whether there is something unique about this particular technological revolution. How is it different, say, than the advent of human writing over 5,000 years ago? The time-scale we’re talking about is not even a blink in evolutionary time. Have we even seen the evolutionary implications of the shift from an oral to a written memory culture? I believe there is something unique about the nature of how we interact with technology – it is multi-modal, attention grabbing, and biologically rewarding (yes, it is!) in a way that writing just isn’t. But we have to push ourselves to articulate these differences, and seek to understand them, and not succumb to a doom and gloom forecast. A recent series of posts on the dailydoug does a beautiful job of this. So, where does that leave us? Ty Maxey wonders if all this is just leading to a technolobotomy – provocative term! – but I wonder if instead we have an amazing opportunity to take these technological advances as a testing ground for us to figure out as a society what we value about those capacities that, for many of us, are what we think make us uniquely human. Remembering is one of the reasons why I write, be it fiction, poetry, or blog post. Maybe this has caused me to have a… fickle memory. I don’t really know, but I’ll take this insight as a reminder to look out for moments that should be digested in the brain and not just recorded in words or photos. Thank you for the eye-opener! Great point. And thanks for reminding me of that post – I’d seen it and forgot to actually read it! I really like her work! You have hit upon so many areas of interest in my personal ongoing study of science, the human brain and creativity. Thank you for your well written words. Excellent. Your articulation of some important concerns is superb! I think that we can’t deny the possible benefits of augmenting ourselves with technology. But as you point out, we have to be very deliberate about which technologies we choose to use, and when. I think that is especially clear when you say: “Facts are easy to outsource to digital devices, but the full, rich human experience is very difficult to encode in anything other than our marvelous human brains. So if we focus on these types of memories, maybe they will become incredibly sophisticated and important to us – even more so than now.” It takes a human brain – what we’ve had for WAY longer than these cyborg technologies – to discern what is important to use cyborg technologies for, and what is important for us to do in other ways. Here is another great example: http://gizmodo.com/5921868/ (“Scientists Invent Particles that Let You Live Without Breathing”). How can we deny the extreme benefits of augmenting our natural ability to breathe? This technology could save countless lives. But we must be deliberate about how, when, and why we use it. People always argue that we can’t become dependent on outside technologies like these ones. But there is a ways to use these technologies without becoming dependent on them – it just requires strong deliberation and understanding. Thanks so much for reading! The “breathing particles” example is so interesting and instructive. I took a quick look at your blog. Really interesting, and what a great combo – lit and astronomy. Lots of interesting directions for you to go in! Thank you very much! I look forward to updates from your blog as well. Minor nitpick: Your links to other blogs @ WordPress don’t work as the urls appear to be a combination of your blog’s url and the other blogs’ urls. Hm…weird. I checked the links that I actually put into my post and they are normal urls….I’ll see if I can fix this. Thanks for bringing it to my attention. Wow, that’s so nice of you! Thanks! Being a tech-head and a Sci-Fi nut, I absolutely loved this post! Thanks for the reblog! I’m glad to discover your blog!